In stock Only 4 left! The Fothon wheel is full of LED lights that light up when rotated. This will bring light to your skating experience turning night into day. Designed with the longer lasting super high rebound PU material, they will give you a high quality performance with a fast and smooth roll. Ideal for urban skating. With Fothon wheels you will become the star of the night. Notice: The wheels will run on a 6mm spacer but the lights can only be activated by an 8mm spacer - This is due to the fact that the generator for the lights sits in the wheel hub. New inline skates or new wheels? The Wheels are too wide and rub on the Powerslide frame. SOMETHING DIFFERENT!!! We like it!!! Thanks Skatepro!!! (H) Valami különleges!!! Tetszik!!! Köszönjük Skatepro!!! So far so good. Wheels spin freely and light up nicely. They definitely turn heads. 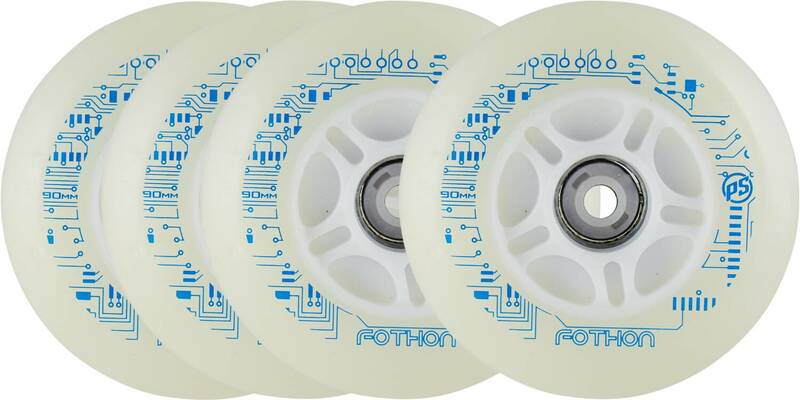 One of the previous reviews mention they are too wide for the powerslide frame, which I did find was the case on the 110mm fothon magic wheels. But not these. I don't have that issue with these wheels. This is my second time order this wheel. I love it.